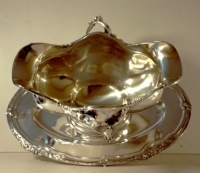 American collectors and specialists in silver usually know much about French, English, Austrian and German silver, but are relatively less informed about Belgian silver. 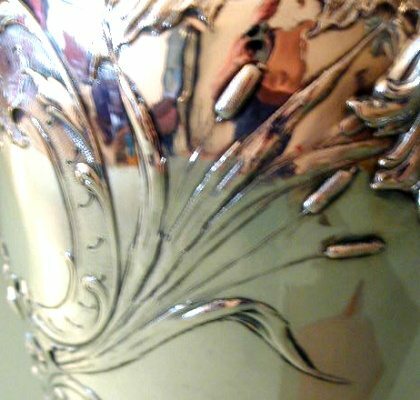 This article about the highly skilled, abundantly ornamented late 19th century silver from the workshop of the Belgian silversmith Wolfers aims at closing that gap. 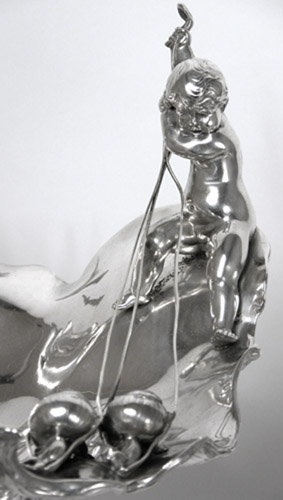 It is largely based on my lectures to younger generations of art lovers over a period of ten years, through which I have endeavored to open the door to the discovery of the quality, personality and creativity of Belgian Silver, particularly that which was made during the so-called Belle Epoque. Strategically situated on fertile soil at the crossroads of Western Europe, Belgium has enjoyed economic prosperity, artistic creativity and a strong tradition of skilled craftsmanship. It is a small country enriched by the interweaving of different ethnicities and cultures--a true melting pot of populations. Surrounded for centuries by France, Germany, the Netherlands and the North Sea, this “slice” of land was highly coveted by its neighbors and it was not until 1831 that it achieved true political independence. Since then, successful industrial development has brought prosperity to an expanding middle class that was already much in evidence during the Belle Époque. The words of the Belgian singer, Jacques Brel “C’était au temps où Bruxelles Brussel ait… “, imply that people of the Brussels middle class were wealthy, prosperous and enjoyed life at that time. 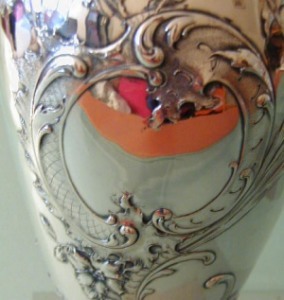 Wolfers was one of the most famous Belgian silversmith companies of the 19th century, its reputation comparable to those of Emile Puiforcat, Odiot or Aucoc in Paris, Garrard in London, and Tiffany or Gorham in America. 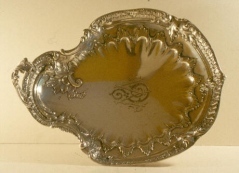 In the first half of the 19th century, three young German brothers, silversmiths Edouard, Guillaume and Louis Wolfers established two workshops in Brussels. 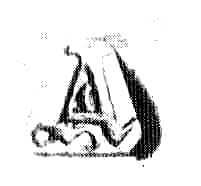 In 1852, Louis Wolfers (1820-1892) registered his maker's mark, consisting of a letter W above a boar's head. His workshop was situated at 23 rue des Longs Chariots. In 1858, he married Henriette Ruthenburg who contributed to the development of the firm. 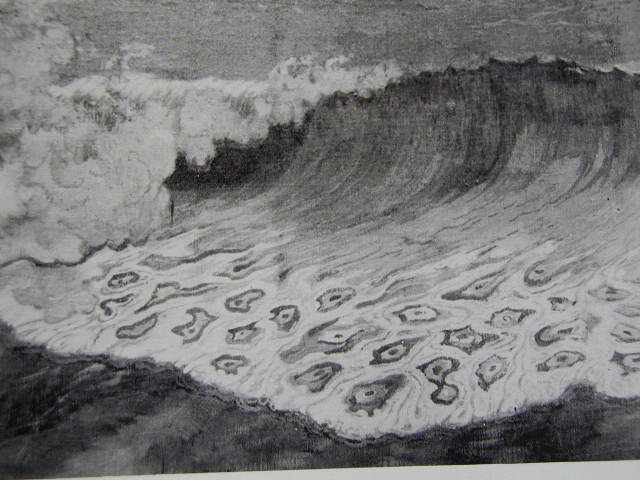 They took part in many different exhibitions and competitions and, by 1868, the firm was achieving financial success. After serving apprenticeships, their three sons, Philippe, Max and Robert were sent to France, Germany, the Netherlands and Austria to prospect for business. As a result, the Wolfers firm became associated with Bonnebacker of Amsterdam, P. Kirscher in Düsseldorf, Goldschmidt in Köln, and Friedlander in Berlin. 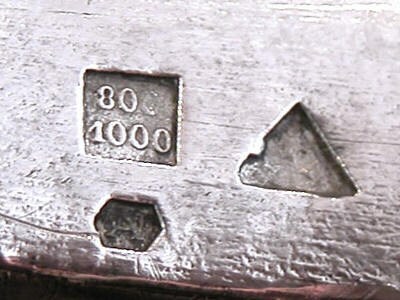 This explains why some German assay and retailers marks are punched with Wolfers marks. In 1885, Philippe Wolfers married Sophie Wildstädter. His bride’s dowry enabled him to become a partner in his father’s business. The firm was renamed ‘Louis Wolfers Père et Fils’. By 1890, Max was playing an active role in the business. 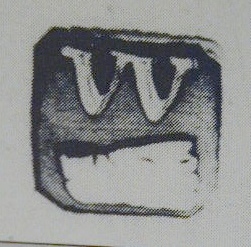 The workshop and shop moved to the Rue de Loxum.1 and the new shop's mark: "Louis Wolfers Père et Fils’ Rue Du Loxum 1 Bruxelles" was conjoined with the former maker’s mark. In 1892, after Louis Wolfers death, the firm was renamed ‘Wolfers Frères’. In 1892, the new maker’s mark, three pentacles (5-point stars) contained in a triangle, was introduced and continued to be used until 1942. It is a rare example of a personal mark using Masonic symbols. In 1897, Robert Wolfers persuaded the firm to install hydraulic presses for the production of flatware. 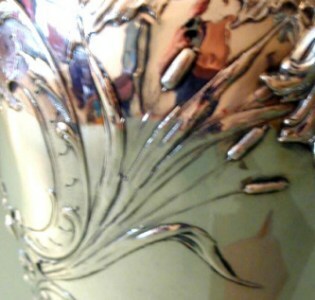 Philippe, the artistic director, played a very important role in the development of the Art Nouveau in Belgium. 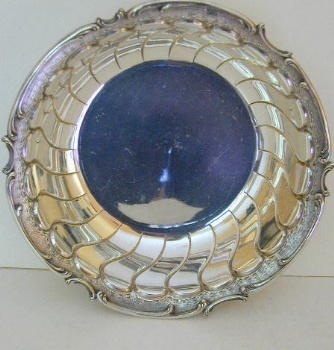 Various jewelers were exclusive agents for Wolfers products. 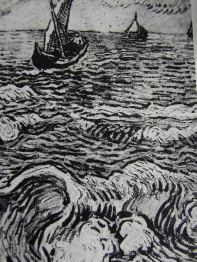 For example, E. Antony in Antwerp, E. Bourdon in Ghent, F.Hardy in Liege, Galerie Aublanc in Paris, and Begeer in Utrecht. Branches were opened in Budapest and Bucharest. 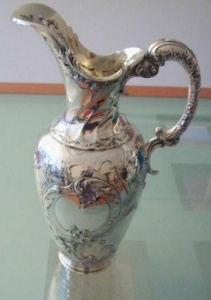 Wolfers silver was also imported into Russia. Wolfers' shop, rue d’Arenberg 11-13 Brussels, 1911 Architect, Victor Horta. An older generation of collectors considers only 16th, 17th and 18th century silver as genuinely ‘antique’; 19th century silver is considered decadent because of industrial production that overtook centuries of handmade silver and also because the emerging 19th century middle social class (i.e., the ‘bourgeoisie’) favored reproductions of 18th century styles (e.g., neo-Louis XV or neo-Louis XVI styles)--they wanted to copy the good taste, manners and ways of thinking of the former aristocracy and, perhaps more importantly, because they wanted their silver to reflect their own success and prosperity. The neo-Louis XV style is often called ‘Rococo’ in a rather disparaging way, but the term was already in use referring to 18th century Rocaille, an extremely eccentric interpretation of the Louis XV style. The so-called Eclecticism of the 19th century is unquestionably a combination of Louis XIV or Louis XVI patterns with Louis XV and Rocaille. Yet, if instead of name-calling, we analyze the styles throughout the different centuries we observe that evolution of styles does not stop or start abruptly but instead glides smoothly from earlier forms toward the introduction of new decorative elements. In the 16th, 17th and 18th centuries, symmetric, geometric, asymmetric, and floral styles alternately followed one another. The Louis XIV style, for instance, was (in a way) a neo-classical style, influenced by Renaissance architecture and ornamentation. 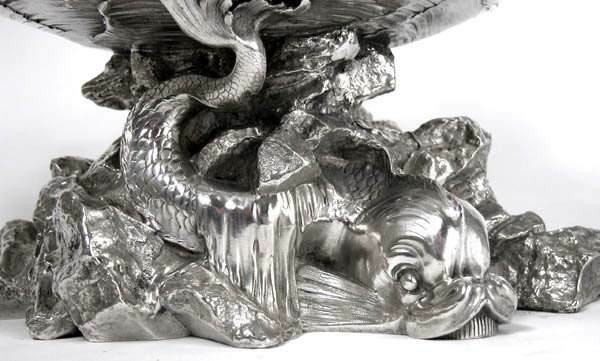 Similarly, we find 18th century LouisXV and Rocaille styles reproducing naturalistic motifs of 17th century Mannerism and spirally fluted Louis XV forms mixed with ‘in-fashion’ Louis XVI motifs. The quality of 18th century handicraft is often idealized and the creations of 19th century silversmiths underestimated. J.F. Hayward in Virtuoso Goldsmiths said, 'Considering the working methods, we have to put aside romantic conceptions of the nobility of handwork. The goldsmith took as much interest in methods of increasing efficiency and reducing costs of production as any modern factory manager. 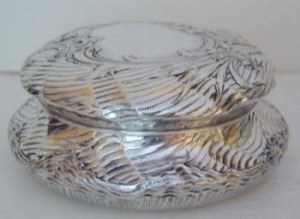 Different processes like casting, turning on a lathe or producing ornaments by means of a stamp were all in use by the second half of the 16th century'. 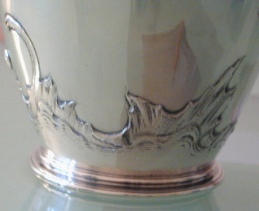 maker: Wolfer Frères, ca. 1892-1900. The wave, as a pictorial theme and ornamental pattern in Japanese art, had a profound impact on European painting, graphic art and applied arts in the second half of the nineteenth century. 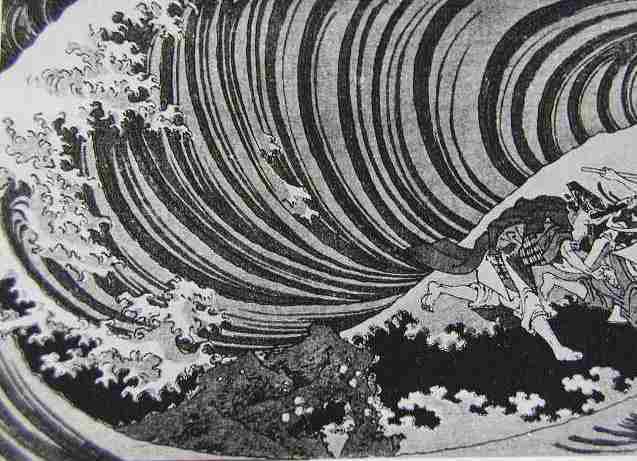 The crest of the wave motif belongs to this form. Sauceboat: maker, Wolfers Frères, ca. 1892-1900. 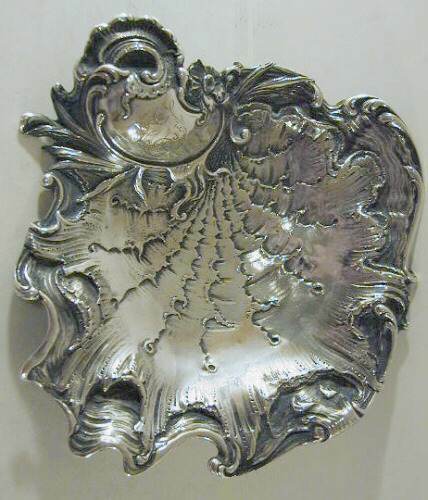 Ice serving dish: maker, Wolfers frères, ca. 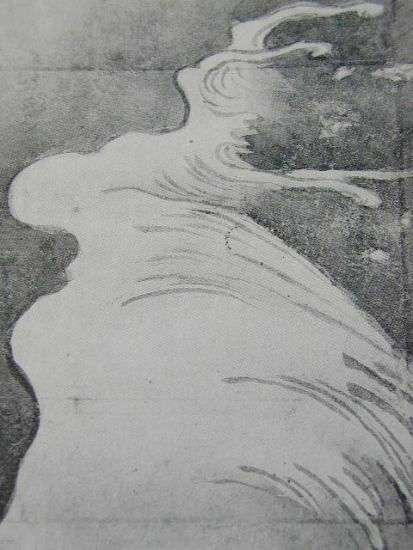 1892-1900. In order to be credible in stating that the influence of Japonisme is found in the ornamental motifs of Wolfers Frères’ silverware at the end of the 19th century, I have taken a few quotes from the the text of the book ‘Japonisme: The Japanese influence on Western art since 1858’ by Siegfried Wichmann. 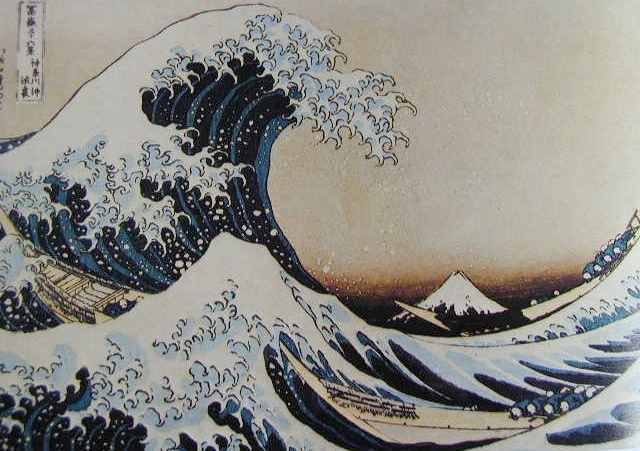 European Painters and graphic artists (and industrial artists too) produced many variations on the wave theme around the turn of the century…. manner, yet still in an impasto’ technique... (in) 'The Sea at Saintes-Maries- June1888…' . 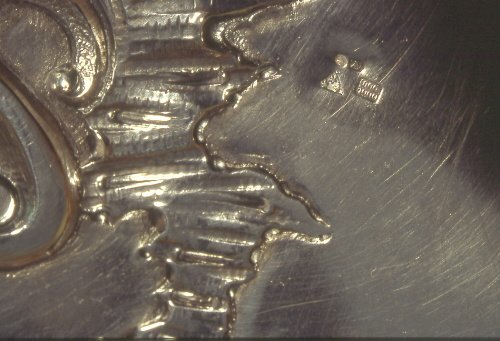 I conclude with a few notes on Belgian silver marks for those who have been persuaded to take a further 'in vivo' look at Wolfers’ magnificent creations. 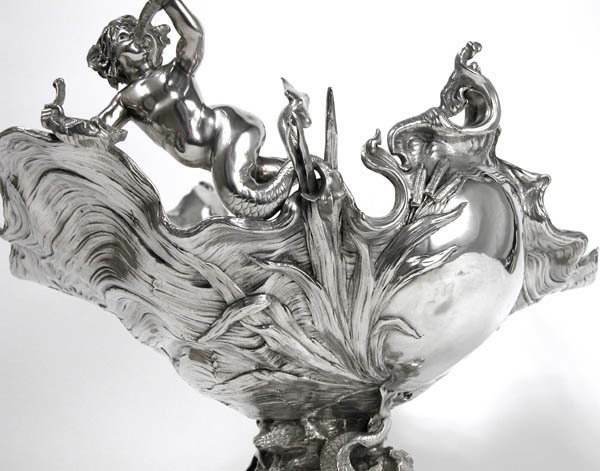 To defend against severe competition of imported silver from France and Germany, the Belgian silversmiths petitioned for a change in the laws governing their work. 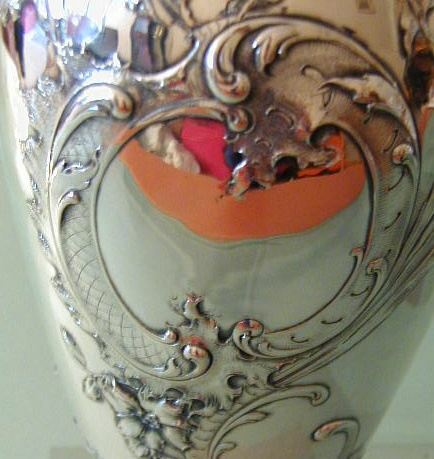 As a result, 1868 to 1942 became a period of great liberalism: official silver standards were lowered to 900 and 800, no Hallmarking office assay was needed and, there was no registration of personal marks. As an unintended consequence of this liberalism, it is today difficult to identify Belgian silver from that period because each of the silversmiths and retailers used their personal assay marks. 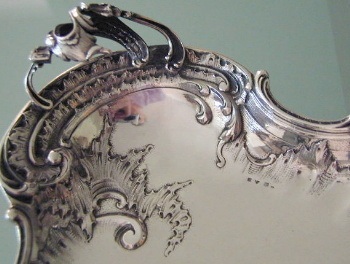 A silver object is guaranteed by means of two marks: the silver standard and the maker-manufacturer or retailer’s mark. In Belgium, the former included the gothic letter 'A' for Argent (silver) and either a number 1 or 2 for the silver standards, 900 or 800, respectively (from Tardy, Poinçons d’argent’). Manufacturers and shops also created and used a wide variety of other content indications, such as from 800 to 950 punched alone or combined with the letter A or combined with a symbol representing the standard in thousandths (i.e. 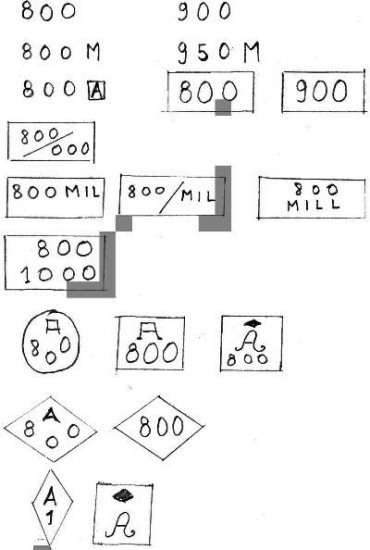 :Millièmes) (M; Mes; MIL; 1000). 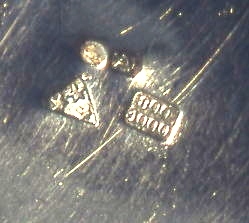 As stated above, one often finds German assay marks (such as the moon crest or the imperial crown) as well as German retailer’s marks combined with Wolfers’ Belgian marks. 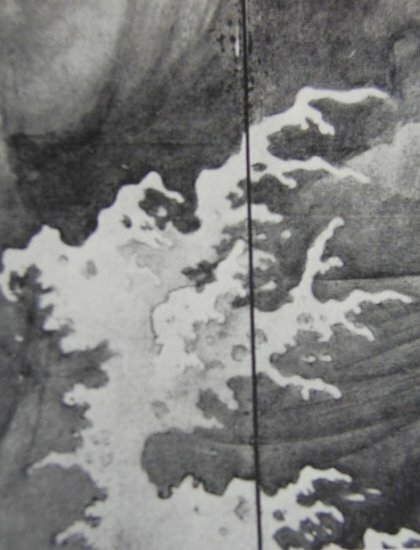 Orfèvrerie au Poinçon de Bruxelles’, 1979, Exhibitions Catalogue Societé Générale de Banque - 13/09 au 30/11 1979. ‘Modern Silver 1880-1940’, Amsterdam 1989, A. Krekels-Aalbeerse. 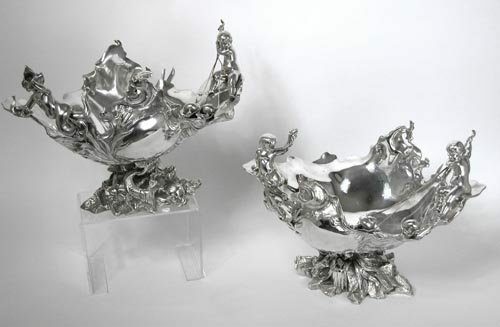 ‘Silver of a New Era, International Highlights of Precious Metalware from 1880 to 1940’ Museum Boymans Van Beuningen, Rotterdam. Museum voor Sierkunst, Ghent 1992. 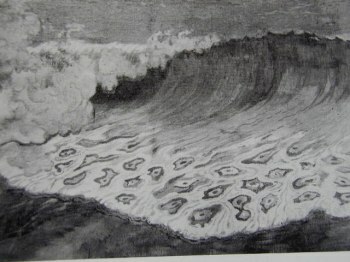 ‘Philippe und Marcel Wolfers’, Art Nouveau und Art Déco aus Brüssel, 1993-1994, Museum Bellerive Zürich. -Belgian Silver 1868-1914. Provinciaal Museum Sterckshof-Zilvercentrum. Antwerpen-Deurne ISBN 90-6625-007-0. 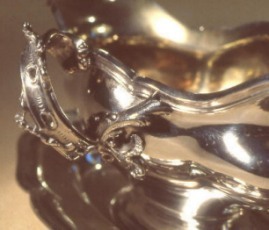 ‘Royal Silver for People and King’, Antwerp 2001, Wim Nijs, Sterckshof Studies 17. 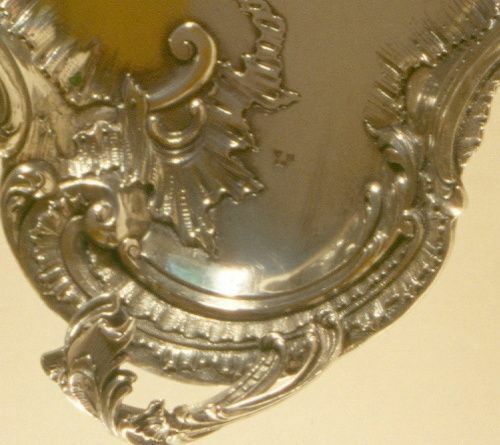 Wolfer hallmarks 1852-1892 and Brussels' shop: ©Catalogue ‘Van Belle Époque tot Art Nouveau’ Sterckshof Museum’ Deurne Antwerpen.